The second season of Stranger Things took us to the most essential of locations for kids of the ‘80s: the arcade. But shoving quarters into a Dragon’s Lair game isn’t the only way ‘80s teens and preteens spent their time. They went to the mall, of course. Netflix dropped a mysterious video on Monday morning that included some exciting teases for Stranger Things Season 3. What begins as a retro commercial for a local mall turns into an update on what Steve (Joe Keery) has been up to since Season 2, and the introduction of a new character. 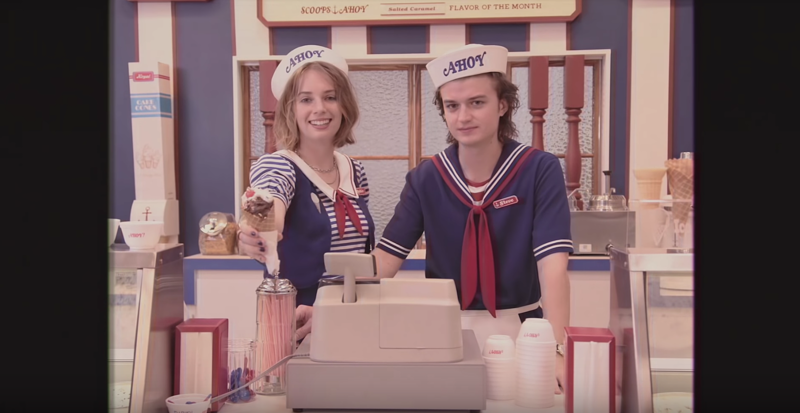 After having one heck of a wild second season, and a heartbreaking end with Nancy, Steve is now working at an ice cream shop inside the mall. And his co-worker? That’s Maya Hawke, Ethan Hawke and Uma Thurman’s daughter, who’s joining Season 3 of the show as Robin. Netflix has described Hawke’s character as “an alternative girl who is equal parts sharp and playful. Bored with her mundane day job, she just wants a little excitement in her life… and gets more than she bargained for when she uncovers a dark secret in Hawkins.” Is that dark secret located inside… the mall? My guess is the mall is more than just a random new setting for Season 3, but perhaps where a new gate to the Upside Down will open up. That would make sense with early casting rumors for the Mayor of Hawkins (played by Cary Elwes), which suggested the threat of the Upside Down may go public in the new season. That’d certainly make for some fun set pieces. The Mind-Flayer just wants to cop the latest Bruce Springsteen single, let him live! Netflix has yet to announce a premiere date for Stranger Things Season 3, but given that the end of the retro video teases “coming next summer,” that suggests the show will return then. And despite last season’s Halloween premiere date, a summer release would be similar to the first season’s July debut. Details remain scarce on the new season, but we know there will be plenty more of Lucas’ (Caleb McLaughlin) wise-cracking little sister Erica (Priah Ferguson), it will take place in the summer of 1985 – the perfect season for mall hangouts – and your favorite dad/Daddy (you decide) Hopper has a brand-new look. Stay tuned for more updates as they come in.